Fuja da cidade por um dia e troque a Cracóvia por Zakopane e as Montanhas Tatra nesta excursão de dia inteiro. Dê um mergulho nas piscinas termais, faça uma caminhada até à Montanha Gubałówka ou ande no funicular e desfrute de vistas panorâmicas sobre a cordilheira. Alternativamente, explore a cidade e sua arquitetura única e mergulhe na cultura das montanhas no seu próprio ritmo. Um passeio de áudio guiado por cortesia de Cracóvia está incluído para uso em seu lazer. The weather played a very bit part in this tour with drizzling and very cloudy atmosphere. So we could not see much of the natural beauty as shown in the advertising photos. The tour guide was also not helping in this regard also and we were not properly informed when her guides have finished and she just walked back to the couch or straight to another locations without informing on a few occasions. We have to make our own assumptions that she is done with one itinerary and is moving to the next or to the couch. And at certain locations which we were supposed to visit she was not even sure about the opening hours and we found they were closed when we reached. 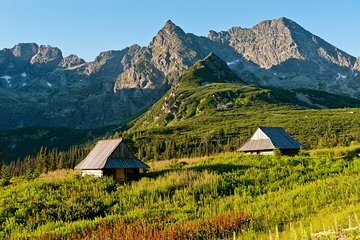 Compared with Auschwitz and Salt Mine tour just a day earlier, this Zakopane tour is really not valued for money we paid. Very very dissatisfied. The driver was lovely... but there is nothing there. We went got dropped off in this little town went to the top of the mountain on the train thingy had a hot chocolate came back down and then had to fill hours with very little. Id avoid or go for a more expensive trip with more things going on.The mountains are beautiful. This tour was amazing, and definetely worth the journey from Krakow to Zakopane. Our driver Tom from Discover Cracow was awesome also. Had a private car and driver. It is a long drive from Kraków to the mountains - better part of two hours. Our guide said almost nothing until we got to the mountains.